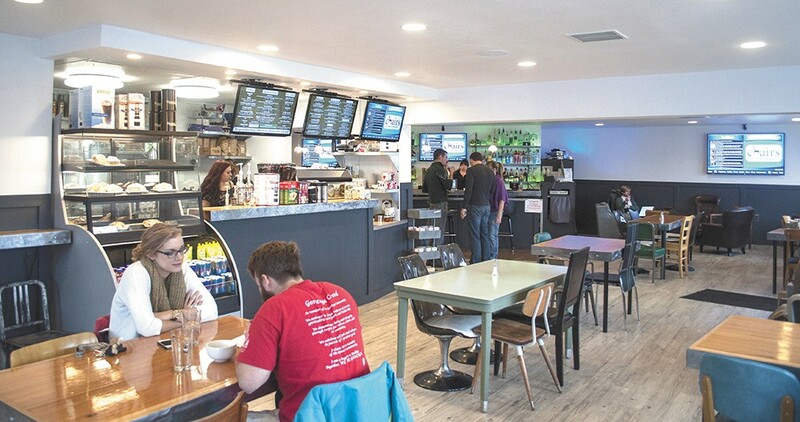 Chairs' new location is a coffee shop in the mornings and bar in the evenings. "When are you going to open?" That's the question the owners of Chairs Coffee got constantly after choosing a second location near Gonzaga last February. So even though the new Chairs Public House is still technically in its soft opening phase — a grand opening is planned for January — it's not a surprise that tables have been filled since the day the doors were unlocked. Gonzaga students crowd around tables with piles of books, while parents chat over Roast House coffee. Even members of the city council have stopped in. The idea is to offer as much as possible under one roof, says Chris Nichols, a co-owner with Mitchell Moczulski and Scott Wilburn. Nichols likens it to the way technology has merged so it's possible to have a phone, camera and computer all in one gadget. "That's what we're trying to do with this business," he says. "It's like the iPhone of the restaurant community." Some people who stop in remember drinking there back when the building was home to the Bulldog for more than 60 years. One of the best parts so far, Nichols says, is when those visitors first step inside and see the renovated space as something entirely new, not just a version of what it used to be. The menu includes most popular items from Chairs Coffee, like the Chair sandwich with roasted turkey, provolone, lettuce and pesto aioli ($8). The burgers, salads and flatbreads come with distinctive touches like ciabatta buns and sweet potato fries, and the avocado fries ($8) have been a hit so far. The breakfast menu — featuring items like a breakfast burrito ($6) and a paleo waffle made with ripe banana ($5) — is served all day. There's no lack of ideas or hesitation about trying them. Karaoke and trivia are in the works, as are plans for art, philanthropy and collaborations with other businesses in the area. And, they say, feedback is always welcome.